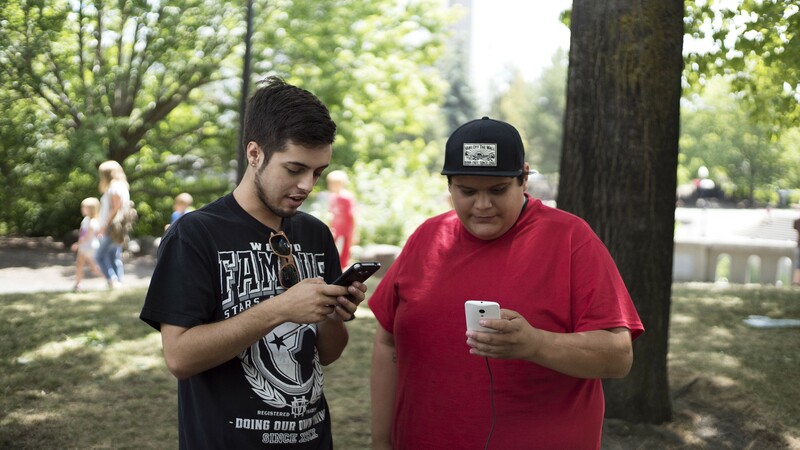 Tyler Zoesch and Daniel Moreno set an in-game lure to attract Pokémon Go characters to an area of Riverfront Park. By now, you've seen them everywhere: Kids and adults of all ages, slowly meandering through the parks and neighborhoods, heads down and eyes glued to their phones. Every so often, they stop — smartphone raised as if capturing an image of some ghostly presence, unseen to observers' eyes. Add one more Pokémon to the Pokédex. Since launching just a week ago, the augmented reality app Pokémon GO has taken hold of our collective attention, spurring myriad media analyses, think pieces, subreddits, Facebook groups and filling your social media feed with friends' reactions — excitement for finally catching the elusive Pikachu, as well as incredulity that the game is seemingly everywhere (it actually is). 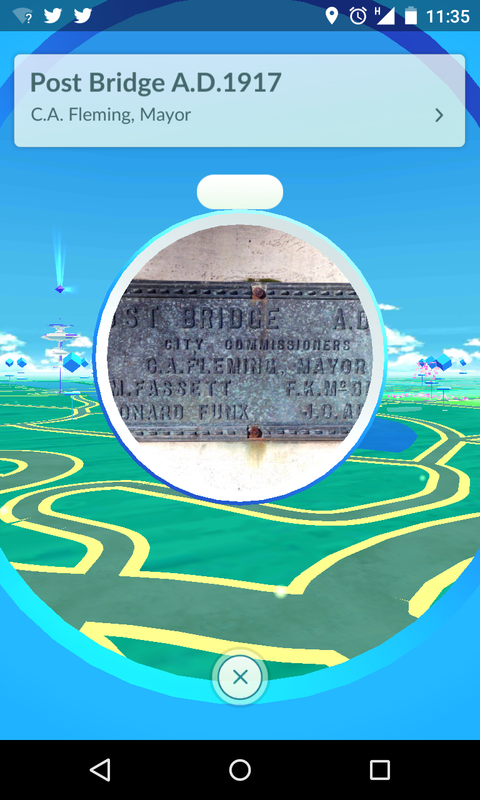 A PokeStop near the Post Street Bridge in downtown Spokane provides free, in-game resources like Poke Balls (needed to catch Pokemon) and Poke Eggs. For the uninitiated, Pokémon GO uses a Google Maps overlay to create a reality-rooted game world, in which actual landmarks, businesses and other places become map points that serve as in-game locations, where players must physically travel to "collect" Pokémon, level up their characters and find in-game resources. Your phone's GPS system then locates you inside the game world so you know where to find these map points. Also, it's free to download and play on Android and iOS devices. Whether you're on board or not, the game has truly ignited the pop culture world. So earlier today, several of us here at the Inlander decided to get out and meet some of the local players getting into the game, while also catching a few Pokés of our own. We headed to Riverfront Park, a hotbed for players eager to nab the other-dimensional Pokémon who pop up along its paved paths with regularity. First, we run into Tony Mowatt, who's been playing the game for the past several days, logging between 8-9 hours, he estimates. "I've always been a Pokémon fan, I started playing the trading card game with my older brother when I was two," Mowatt says. "When I heard about it a year or so ago, I knew when it came out that it was something I had to get." He's caught several hundreds of the cutesy creatures so far, and has enjoyed seeing how the game has brought people outside to interact and socialize with each other over a common interest. Next we meet two construction workers taking their lunch break in the park, one of whom had also grown up playing other Pokémon games. Bryer Reynolds and Ash Oehler have each added more than 60 Pokés to their collections so far. "It's cool seeing everybody out walking around and not stuck in their houses," Reynolds says. "It's nice outside, and everyone is enjoying the weather and hanging out with each other." Setting up shop on a park bench on Riverfront Park's Canada Island, Tyler Zoesch, Daniel Moreno and a group of their friends are waiting out the next 30 minutes to catch the fruits of an in-game lure they've set to attract the randomly generated Pokemon to that particular area of the park. Other Poké hunters meander the area, taking advantage of the lure the guys have set. Moreno has been playing since the game was released a week ago. As for many other players, Pokémon GO has been a positive experience for him, too. "I don't remember the last time I spent this much time in the park," Moreno says, adding that he's the only one of the group who played Pokémon as a young kid. The other guys have been gibing him for knowing all the characters' names. "I think it's pretty awesome," he summarizes. "I think it relates a lot of people to the same thing, it's pretty cool."